The congregation of the School Sisters of Notre Dame was founded on October 24, 1833, when Caroline Gerhardinger and two other women began a common religious life in Bavaria in present-day Germany. This new congregation came to life in response to God’s call to address social needs of the times through the education of girls. The state had confiscated church possessions and dissolved most religious congregations, which deprived many girls of an opportunity for education. The School Sisters of Notre Dame began as educators and continue as educators. Now located throughout the world, SSNDs serve in a variety of ministries, grounded in the concept of transforming the world through education in the broadest sense. Learn more about our beginnings below, and explore the rest of our website to find out how we continue to impact the world. Blessed Theresa was born Caroline Gerhardinger (1797-1879), and lived during turbulent times in Bavaria. At the age of 15, she was already a certified teacher in the girls’ school in Stadtamhof near Regensburg. She was a gifted educator whose enthusiasm and encouragement made her a beloved teacher. Under the spiritual guidance of Bishop George Michael Wittmann (1760-1833), Blessed Theresa gradually recognized God’s call to found a religious community in response to the current educational needs. On November 16, 1835, she professed her religious vows and took the name Mary Theresa of Jesus. Her love for God helped define her goals: to know God and to do God’s will. Blessed Theresa anchored her community in poverty and dedicated it to the Virgin Mary. The first sisters were received in Neunburg vorm Wald on April 10, 1836. Blessed Theresa sent sisters in twos and threes to small towns and villages where they taught girls who had been deprived of an adequate education. In 1843, she moved the congregation to a new motherhouse in Munich. Missionaries from America soon came to visit and to ask if the School Sisters of Notre Dame would come teach the children of German immigrants who were arriving in rapidly increasing numbers. Blessed Theresa and five sisters, including young Mother Caroline Friess, arrived in the United States in 1847. Blessed Theresa returned to Munich a year later, leaving Mother Caroline as a leader in the United States. Upon her return to Bavaria, she began opening houses in present-day Germany, Austria, Italy, Hungary, Romania, Poland, and the Czech Republic. The demand rose for sisters to staff schools and orphanages throughout these areas. In 1865, Pope Pius IX approved the rule and constitutions of the School Sisters of Notre Dame. Blessed Theresa continued to govern the congregation as its general superior until her death in Munich on May 9, 1879. On November 17, 1985, Mary Theresa of Jesus Gerhardinger was declared “Blessed” by Pope John Paul II at St. Peter’s Basilica in Rome. Mother Caroline was born Josepha Friess (1824-1892), and entered the congregation in Neunburg vorm Wald in 1840. Two years later, she was given the name Mary Caroline. 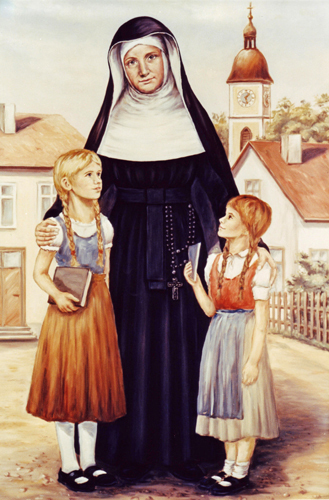 Her leadership potential, her great love for children and her many other extraordinary gifts were immediately recognized by Blessed Theresa, and she was entrusted with difficult teaching positions in Bavaria until her departure for America in 1847. In 1848, Blessed Theresa placed Mother Caroline Friess in charge of the schools in the United States. Two years later, she was appointed Blessed Theresa’s representative in North America. 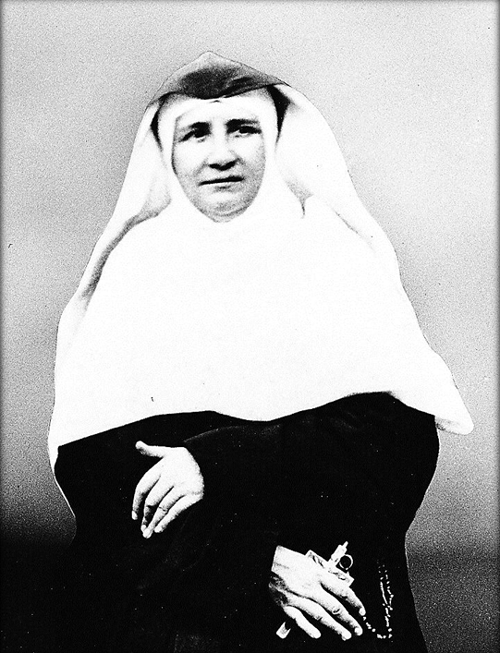 Mother Caroline was 26 years old and had 24 sisters, 17 candidates or prospective members, 30 orphans and about 1,250 students entrusted to her care. Mother Caroline’s first task was to establish a motherhouse in Milwaukee, where she admitted and prepared thousands of new sisters. She continued responding to needs by sending sisters to hundreds of missions in the United States and Canada. Many of these schools and houses were located up and down the Mississippi River. Mother Caroline faced many struggles along the way, such as working with local communities and parishes living in poverty. She also found difficulty maintaining a balance between the students’ native cultures and languages and the demands and expectations of immigrants in North America. Despite struggles, Mother Caroline’s spirit did not waver. She continued to send sisters wherever they were called, including small towns, rural parishes and large cities. At the time of her death on July 22, 1892, Mother Caroline had created an educational network that included approximately 200 convents, 2,000 sisters and 70,000 students. Responding to the call to teach children of German immigrants in North America, the first School Sisters of Notre Dame arrived in New York in 1847. By 1850, sisters were teaching and caring for children at six missions in Baltimore, Philadelphia, Pittsburgh and Buffalo, New York. Before returning to Europe in 1848, Blessed Theresa appointed Mother Caroline Friess as her representative in North America and sent her to open a motherhouse in Milwaukee. Mother Caroline, three sisters and a candidate arrived in Milwaukee on December 15, 1850, and within two weeks, they were teaching the children of German immigrants in a nearby parish school. More women asked to enter the congregation, and by 1876, sisters were teaching and caring for children at approximately 150 missions in Wisconsin and 15 other Midwestern, Northeastern and Southern states, as well as in Ontario, Canada. New provinces were formed with provincial houses in Baltimore (1876); St. Louis (1895); Mankato, Minnesota (1912); Waterdown, Ontario (1927); Wilton, Connecticut (1957); Dallas (1961); and DeKalb, Illinois (1965, later in Chicago). During the first half of the twentieth century, North American Catholic missionaries were called to other lands, and the School Sisters of Notre Dame responded by sending sisters to Puerto Rico in 1915, England in 1934, Japan in 1948 and Guam in 1949. Young women from these places soon became sisters and brought new cultural dimensions to the life and ministry of the international congregation. Eventually these four areas were known as regions of the congregation. 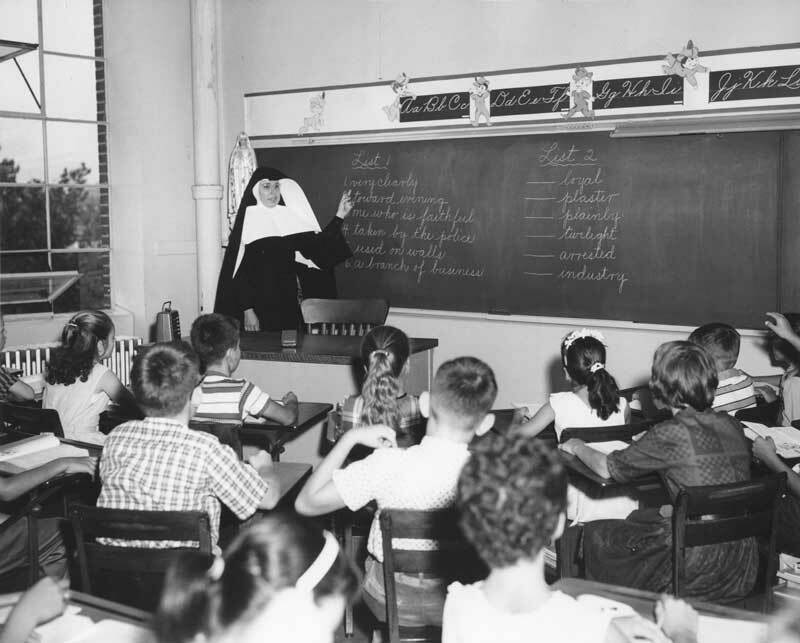 By the late 1960s, nearly 7,000 School Sisters of Notre Dame from the North American provinces were called to proclaim the Good News through many forms of educational ministry in schools, parishes and other areas of need in the United States and Canada. In response to Vatican Council II, the School Sisters of Notre Dame also sent missionaries to Central and South America, Africa, Asia and the Pacific Islands. At the beginning of the new millennium, the School Sisters of Notre Dame, smaller in number, intensified their search for more effective ways to use their resources to further God’s mission. The Baltimore, Chicago, and Wilton Provinces formed the new Atlantic-Midwest Province in 2006. Six years later, the Canadian Province was integrated into the Atlantic-Midwest Province. After years of consultation, planning and prayer, the four provinces based in Milwaukee, St. Louis, Dallas, and Mankato, Minnesota, became one province, the Central Pacific Province, which was inaugurated on the feast of Pentecost, June 12, 2011. The Region of Japan integrated into the Central Pacific Province in 2013. Sisters of the province live and minister not only in the central part of the United States, but as far as the Pacific Coast but also in Austria, Italy, Japan, Nepal, and the U.S. territory of Guam – giving us our name, Central Pacific Province. Learn more about the Central Pacific Province’s leadership, ministries and locations.